For those of you who may not know, I’m a big Oprah fan. One of my life goals is to meet her in person. I know, everybody’s an Oprah fan. lol. I do have a logical reason why I admire her though. There aren’t that many people talking about lifestyle design on a major platform right now. Even bigger than that, Oprah’s the only person willing to create an entire network around inspiring people to awaken possibility in themselves and others. So, why wouldn’t I be a fan?! That’s what my entire blog is about! But this post isn’t about that. This post is about how I ended up at an event, only yards away from Oprah without even planning to attend. This post is the blow-by-blow to how I got access to a sold-out event here in Atlanta, GA merely hours before it started. The back-story to how I ended up at this event is beyond my wildest expectations. It just serves to show that you never know what may come along when you are willing to awaken possibility in yourself. It all started this past Friday night around 9:45pm while I was watching Oprah’s Life Class Live on Facebook. It’s been my usual routine every night to watch her class on OWN, so I wasn’t expecting anything spectacular other than 2 hours of life-changing insight and wisdom. Close to the end of the class, Oprah announced that she would be in Atlanta on Saturday for their annual O You! event. I had no idea what she was talking about. I was thrilled at the idea that she was coming to Georgia since she rarely comes. So I got on Google and immediately searched for “Oprah Atlanta”. What came up was a link to an article. After clicking on the link and reading through the article, I found a link to the O You! website. Still not fully sure of what it was, I clicked on the link and began my investigation. I perused the website and learned that O You! is an annual one-day event hosted by O Magazine that seeks to bring the magazine to life with talks from contributors of the magazine, products offered in the magazine, and more. I found out that he tickets were $125 and were already sold out! My initial reaction was, “There’s no way I’m going to that thing!” Even though I know it’s a life goal of mine to see Oprah in person, I knew I wasn’t able to get a ticket even if I tried. Like most people, my investigation would have ended there. But since I’m on an adventure to awaken possibility in myself, I thought of all of the possibilities one could have to get access to a ticket to a sold out event. Then I had an ‘Aha moment’… Twitter! I knew social networks were great for connecting to people who were attending major events. I figured I would search for available tickets and see what I find. I had nothing to lose, so I tried my luck. To my surprise, I couldn’t hardly find anyone trying to give away or sell tickets. Most of the tweets were people like me who were looking for tickets. After scrolling through past tweets, I found one tweet from one lady who trying to sell a ticket. However, that tweet had been posted 2 days earlier and had already gotten requests from other people. I figured that the ticket may have already been sold since I was 2 days late. Still feeling lucking, I went ahead and inquired anyway. I sent her a tweet and waited for 10 minutes, but I didn’t get a response. I scrolled through her past tweets and surprisingly found her email address that she had posted in one of her other tweets. Building up the courage, I emailed her. She responded back within minutes saying that she had gotten her money back for her ticket, but her cousin still had a ticket that she was willing to sell. I offered to buy the ticket for $75 and she agreed. Now the problem was verifying that the ticket was real. She wanted me to pay the $75 upfront on Paypal before she emailed me her cousin’s ticket. I wasn’t sure if that was a fair deal. I emailed her back letting her know my thoughts and I decided to turn down the offer because I didn’t want to send money not knowing if it was legit or not. Think about it… I didn’t know this lady from a can of paint, and she was expecting me to pay before I even saw the ticket. Being scared and unsure, I sorta backed out. But it didn’t end there. By this point, I felt that I had awakened as much possibility as I was willing to awaken. I had sorta given up. Maybe it wasn’t meant for me to go. I didn’t want to risk paying $75 to a person I didn’t know. What if it was a scam? What if this was a person using Twitter to get money from people looking to get tickets to sold out events? Like any overly rational person, I thought through all the negative “What ifs?”. But then something unexpected happened. She emailed me back saying that she would go ahead and email me the ticket, trusting that I would pay once I was able to see that the ticket was real. Once I got the email and looked over the ticket, I went back on the O You! website to see if I could find some information about the ticket just to make sure the it was real. It was clear that all tickets would be emailed to the recipient and would have to be printed out and brought to the event. There was also a QR Code on the ticket that she emailed me. Being the techie that I am, I quickly downloaded a free QR Code App on my iPhone and scanned the code on the ticket in the email. Surprisingly, my phone pulled up the O You! website. It seemed legit, but I still wasn’t sure. I emailed her back and asked if she could email me the confirmation email for the ticket so I could verify that the ticket was real. As I was waiting on a reply, I thought about just calling her and talking about the ticket. This would prove that I was actually emailing a woman and help to calm my uncertainty. I sent another email asking if I could call her. By now, it’s almost midnight. She agrees and sends me her number. I immediately remembered that she had told one of the people who were requesting a ticket on Twitter that she lived in Michigan. Thanks to Google, I checked to see if the area code she sent me was a Michigan area code. After googling it, I found out it was. Everything was feeling legit. Now all I needed to do was make that phone call to seal the deal. When she answered the phone, I realized she was really a woman. This helped to easy the uncertainty. She explained why she and her cousin were both not attending the event due to unexpected circumstances. She laughed and told me that she understood why I felt a little uncertain about everything. It was their first time doing something like this. She also said they had a hard time setting up a Paypal account just in case someone was willing to buy the ticket. During our phone conversation, she surprisingly suggests that I go ahead to the event first and enjoy myself. She said this would prove that the ticket was real. Then she said that after I attend, I could make the payment on Paypal. What an offer! Not only was I one step closer to realizing a life goal of seeing Oprah in person, but I was practically given a $125 ticket that I didn’t have to pay for until AFTER I attended the event. Talk about a WOW moment. I agreed to the offer and tried to maintain my compulsion until I got off the phone. I ran over to the printer and printed out the ticket. I was so overtaken with excitement that I called a friend of mine and my mom, and spilled the news on them at 12 o’clock in the morning. They were excited too, even though it was past midnight. Think about it: Here I was just hours ago, watching OWN like everybody else. And within 3 hours, I’m sitting on my bed with a print-out of a ticket to a sold out Oprah event! The weird thing is that there were SO many other people on Twitter and Craigslist who were still trying to get tickets, and even more who were upset that they couldn’t go. And here I was with a ticket practically handed to me in a matter of hours. I was delirious and humbled at the same time. I arrived at the Georgia World Congress Center at 8am and got in an ultra-long line full of women. I’m pretty confident in my manhood, so I wasn’t worried that I was literally the only young African American male at an event full of 5,000 women. There were maybe 100 men there, but I wasn’t there for them. This was all about impossible becoming possibile for me. Even though I was in line, I was still uncertain if the ticket would work or if I would have trouble getting in. After 20 minutes in line, I finally reached the door. And like clockwork, I handed them my ticket print-out and they gave me my badge. It was official. I was in. It was a smooth entrance. 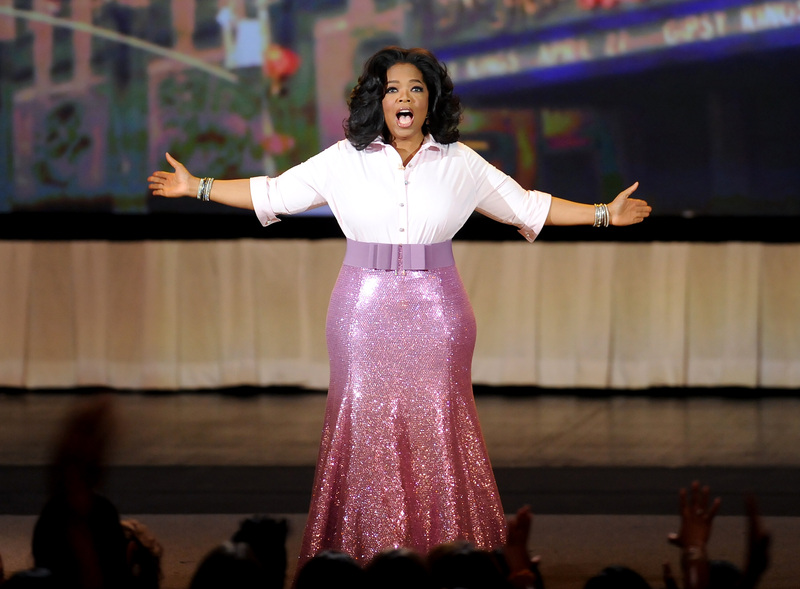 Then came the finale… Oprah! The event ended around 4pm. We were each given a bag of goodies. Most of that stuff was for women, so I’ll be giving that bag to my mom. lol. But what I did take away was a phone full of pictures, 17 minutes of Oprah’s talk that I captured on video, and memories that will stick with me forever. As I reflect over this unplanned day, it hit me: Over 5,000 of us (mostly women) showed up at an event with one goal… “To awaken possibility in ourselves and to help others do the same”. That’s my life-mission. And I was at an event where everybody in the room aspired to do the same. Talk about EPIC! And what’s even more cool is that I was only yards away from one of my biggest role models and mentors. Seeing Oprah in person isn’t about seeing her, it’s about proving to myself that anything is possible. That I can aspire to meet someone like her and literally end up yards away from her at an event I didn’t even plan to go to. I left with joy rising. Hope. Happiness. A since of knowing that I am a part of something great. Possibility. And an inner certainty to run, fly, soar, higher, Higher, HIGHER!!!! A N Y T H I N G I S P O S S I B L E .
I left with a greater sense that I am on the right path spiritually, mentally, and financially. I’m pursuing my dreams and accomplishing my life goals. This event served as affirmation and inspiration to continue to awaken possibility in myself, to live my BEST life everyday, and to help others do the same. I am. And I will. Oh yeah, I did send that lady the $75 after the event by the way (just in case you’re wondering). Bro! This is awesome! This is only a reminder of what we really can accomplish if we put everything we got into our dreams. I like that you said awaken, because everybody has possibilities, but true achievement comes to those who awaken the potential of those possibilities. Keep doing what you do bro, great inspiration. Hey Fred! I stopped by your site and looked at your work. Awesome work bro’! I totally agree that all of us have potential and possibility. As Oprah would say, “Your purpose is to live out the fullest expression of yourself in the earth.” And I agree. Thanks for posting. I guess you can say I’m your classmate, as I’m tuned in to LifeClass too. Nice to know I’m not the only African-American 20 something male fan of Oprah. Ps. I started using Whoot a lot after I discovered your blog. Hey man! Thanks for stopping by and reading the post. Life Class has been amazing so far. I really like Oprah’s new approach to offering her insight. The use of Facebook, Twitter and the Life Class app have really enhanced the experience and interaction. All my friends know how much of an Oprah fan I am. I know she’s massively supported by women and a her topics tend to cater to women, but the insight and wisdom she brings to the world is priceless. It’s definitely empowered me to live my best life and be a more mindful and optimistic young man. Dude, I think it’s so cool you’re using “WHOOT!”. It’s literally the way I express the energy and excitement I feel everyday through the web. Most people who know me know that I never say it in person because they can feel the energy and excitement when I’m around. But since those online can’t feel it, I figured “WHOOT!” would suffice. lol. Thanks again for stopping by dude!